The name Expedition implies adventure and long distance travels. I would say that Catrike named this trike appropriately. 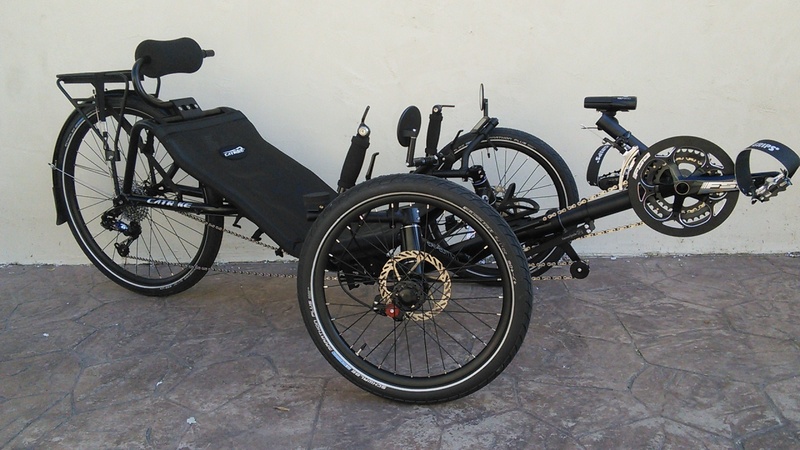 The Expedition's seat height and recline angle make this a very comfortable trike to spend hours at a time riding. The long wheelbase and adjustable steering make handling a dream. 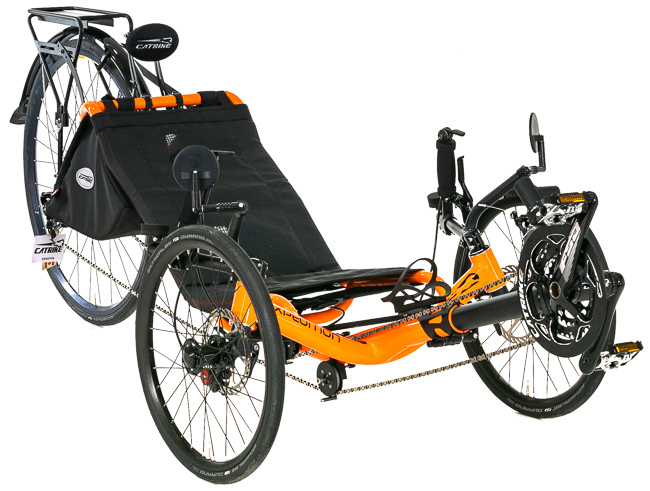 The Expedition, like all Catrike models, features a solid frame with an integrated seat. This design is extremely light and rigid making it very fast. While most of the Catrike models come with 20-inch wheels all around, the Expedition's trademark is its larger 26-inch rear wheel. 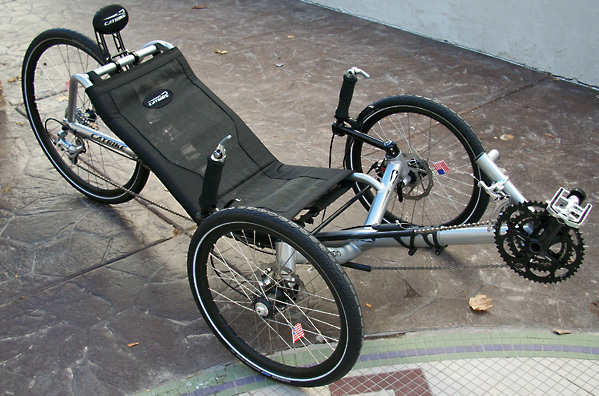 The larger wheel in the back raises the Expedition's gearing and also makes this the largest Catrike. The first thing you'll notice when riding the expedition is the reclined seat angle. While casual riders may not want to lay this far back, anyone who rides for hours at a time will appreciate the full back support the recline gives you. The new Catrike seat features padding around the frame and cargo pockets in the back. The Expedition also includes an adjustable headrest. Catrike has mastered direct steering for trikes. The steering geometry is tight and responsive like a high-end sports car. At slow speeds the handlebars are easy to turn making the trike very nice to maneuver. As you go faster the steering tightens up and you feel more of the Expedition's straight-line tendency. This makes fast downhill runs an absolute blast with the perfect cornering behavior. 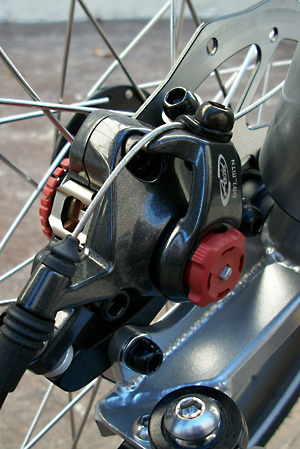 In response to customer requests, Catrike has virtually eliminated brake steer on the Expedition. This means that you can squeeze just one brake lever and the trike will still stop straight. This is especially good for riding in traffic when you are using one hand for signaling. At high speed (30+ MPH) you will notice just the right amount of brake steer which is perfect for hard cornering. I should also mention the adjustable handlebars. The handlebars have 3 adjustments so it is easy to get the perfect fit. If you are a big guy like me you can adjust the bars to a maximum width of about 23 inches. The bars will swing in as close as you want them, but a wider position will give you the tightest turning radius. The handlebars can also be moved forward or backward to adjust for arm length. Moving the grip towards the kingpin will also affect how easy the wheels are to turn, so there is some balance there. Lastly, you can adjust the handlebar's tilt toward you for the perfect wrist positioning. Getting the handlebars set correctly will take some time but is well worth the effort as it will eliminate arm fatigue and improve your control of the trike. The Expedition comes stock with the Avid BB7 disc brakes. The BB7s are probably my favorite mechanical brake. They are easy to adjust without tools and have a great pull. Catrike pairs them with the FR5 levers, which work fine, but they really should be matched with the Avid Speed Dial levers. All the Catrikes feature front quick release axles which allow the front wheels to slide through the brake calipers for breaking the trike down into a smaller package. If you plan on doing this often take care when replacing the wheel to not damage the brake pads. 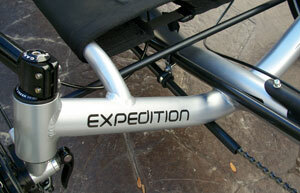 The Catrike Expedition comes with a great drivetrain package. Its standard gearing is a 27-speed derailleur combo featuring Shimano Ultegra bar end shifters. They've matched the shifters to a Shimano LX derailleur in the rear and a Microshift derailleur in the front. 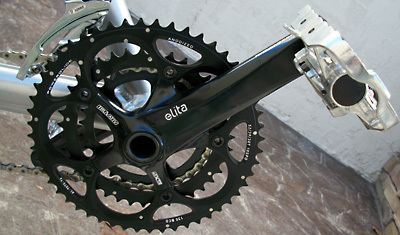 The stock gearing includes a Truvativ Elita EXO 165mm Triple Crankset (52/39/30) and a SRAM PG950 11-32 cassette in the back. This combination gives the Expedition a gear range of 23-118 Gear Inches with aproximately 15 distinct gear ratios. This gearing should be adequate to climb most hills with ease and reach speeds of of over 30 MPH at 90 RPM. As with all the trikes we sell, we offer many different gearing options to suit your individual needs. My favorite is the Schlumpf High Speed Drive which will expand your gear range to 21-153 Gear Inches. For those of you that prefer grip shifts we can switch you to the SRAM X9 component group. Very little will affect riding performance like the proper tire selection. The Expedition comes stock with Schwalbe Marathon Racer tres. These are a good all around tires and provide for a fairly smooth ride. They have a fair amount of puncture resistance but cannot withstand a direct attack from a nice Goathead (which we have many in these parts). Their speed rating is in the middle. While certainly not a slow tire they won't win you any races against the roadies. I had the opportunity to test the expedition this year with several Schwalbe tires including the Marathon Plus, Marathon Supreme, Big Apples, Kojaks, and Duranos. Depending on what type of riding you intend to do you may want to consider swapping tires. 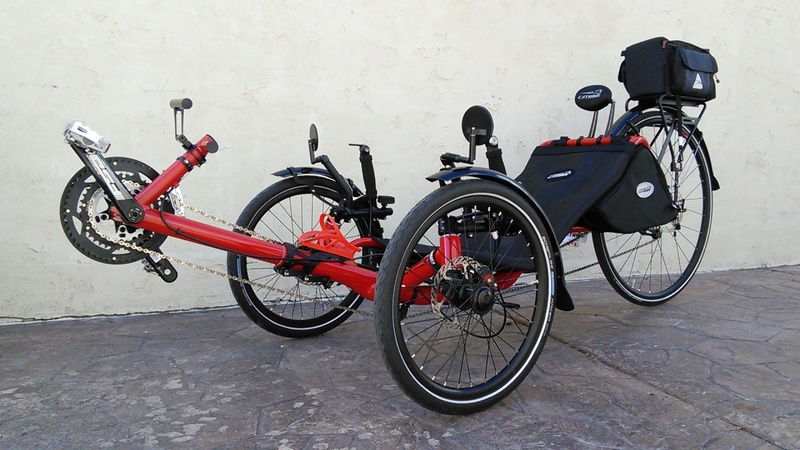 When comparing the Expedition to the other Catrike models you will want to consider the seat angle and larger wheel. Depending on the type of riding you intend to do there may be another model that suits you better. If you will be commuting regularly or are planning some touring the Expedition should be near the top of your list. I've been very happy with the Expedition.